G'day mates! We are Bas and Lokes Straps. "Expedition" is casual and luxurious. 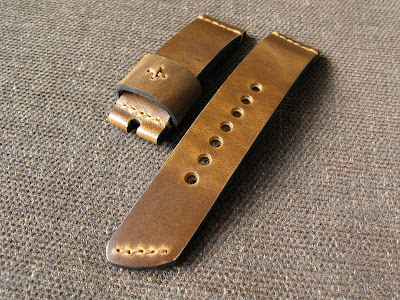 This custom watch strap is a warm chocolate brown brushed type of cow leather that feels something like suede or nubuck. 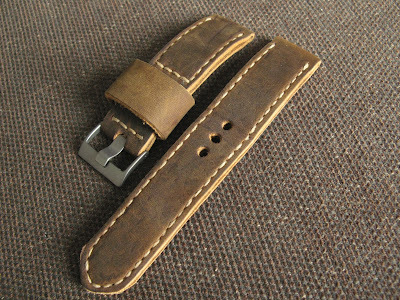 This leather is beautiful and feels great on the wrist.. At 4mm thick, this strap features beige stitching, a pointed tail and a loose keeper. the "Expedition" strap is a very limited edition. 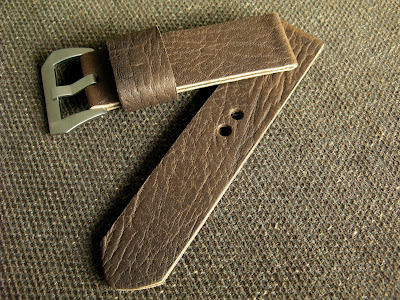 We only have enough of this leather to make 5 of these beauties. Buckle not included. "Expedition" price $105 USD Shipped Worldwide. 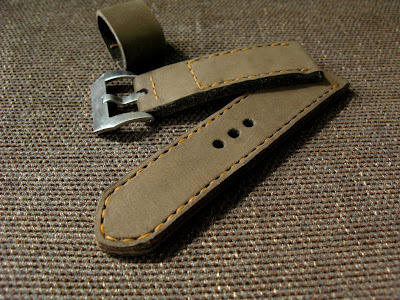 "Officer[/B]" is a very lightweight and soft handmade watch strap. 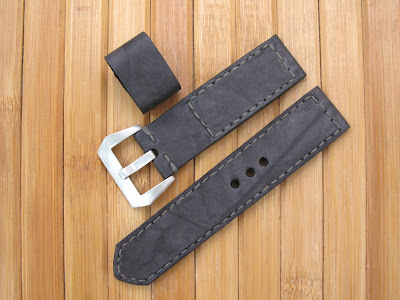 It is 3mm thick and made of a walnut colored buffalo leather. It features a really soft texture and little indentations throughout. This will look great on your pilot or other casual large watch. It is saddle stitched with beige waxed thread. Buckle not included. "Officer" strap price is $85.00 USD including shipping worldwide. "Warmoose" was inspired by a customer and is smooth, sophisticated and rugged all at once. 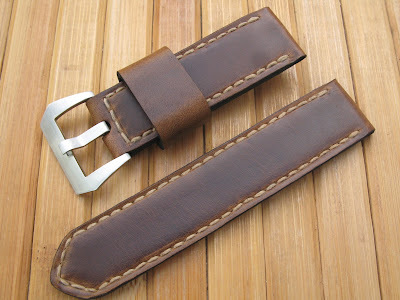 This custom watch strap is constructed of the highest quality pull up leather in a handsome tobacco brown that lightens up and slightly distresses when bent. 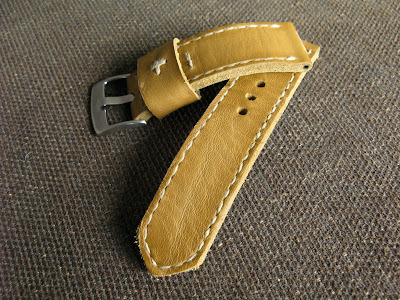 This 4.5mm custom strap features a rusty orange thread, slanted tail and a loose keeper with a cross stitched on it. Buckle not included. "Warmoose" price $105 USD Shipped Worldwide. "Flieger" is very slick and luxurious feeling at the same time. It is a very gorgeous and unique grey black color with a hint of blue. 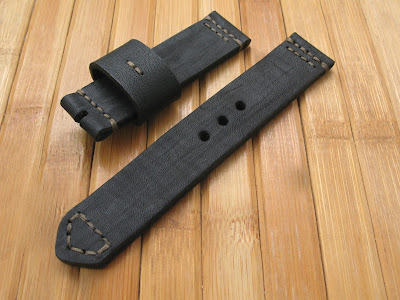 This custom handmade watch strap is 4mm thick, is cow leather, has black smooth sides, a loose keeper and saddle stitched with a grey waxed thread. With its rugged good looks it will suit any large watch. It has one loose keeper and a pointed tail. Buckle not included, but available for purchase on our buckles page. 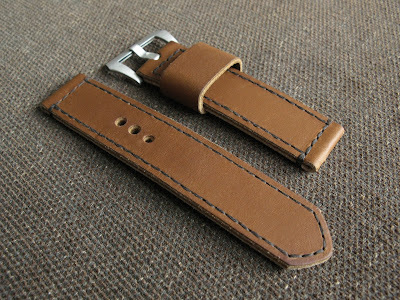 "Flieger" strap price is $105.00 USD shipped worldwide. 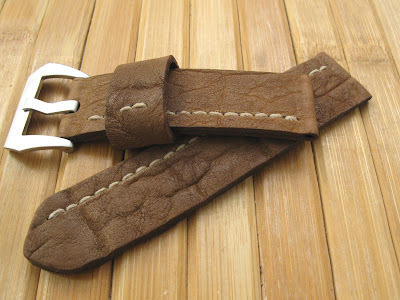 To determine the strap wrist size you require please refer to the sizes below. Contact us at orders@BasAndLokes.com with your specifications or any questions you may have or look us up on the web. We have lots of other straps available. :-!